The leader of a powerful al-Qaeda faction in Syria has given its rival breakaway group a five-day ultimatum to accept mediation to end infighting or be “expelled” from the region. Abu Mohammed al-Golani, the Nusra leader, on Tuesday delivered his ultimatum to the leadership of the Islamic State of Iraq and the Levant (ISIL) and other Islamic factions. Golani warned the ISIL that it would be driven both from Syria and “even from Iraq” if it rejected the results of arbitration. “We are waiting for your official answer within five days of issuing this statement,” said al-Golani in the recording posted on the internet. Fighting between the rebel factions has killed hundreds of people since the beginning of the year and is undermining the wider battle against President Bashar al-Assad. The warning comes two days after the killing of Abu Khaled al-Suri, who had acted as al-Qaeda chief Ayman al-Zawahri’s representative in Syria. Rebels and activists believe he was assassinated by two suicide bombers from the ISIL. Zawahri has named Nusra as al-Qaeda’s branch in Syria and has disowned ISIL, which sprang from the group originally known as al-Qaeda in Iraq. The Iraq-based group has angered other factions with its brutal tactics and harsh laws in areas it controls in the northeast. 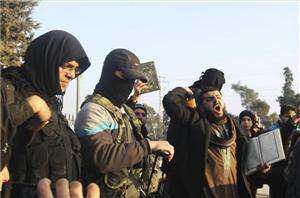 Nearly 2,000 people have been killed in fighting between the group and other factions, including Nusra. In his audio recording, Golani suggested the arbitration be conducted by three senior al-Qaeda ideologists, including two imprisoned in Jordan and one imprisoned in Saudi Arabia. He did not say how they would handle the arbitration while in detention. Both Nusra and ISIL are considered terrorist organisations by the United States.